The generosity of the Don Alspach Memorial Fund at the Marion Community Foundation has enabled the park district to commission a series of beautiful interpretive signs, to help our visitors better understand the wonderful natural environment that surrounds the Marion Tallgrass Trail . 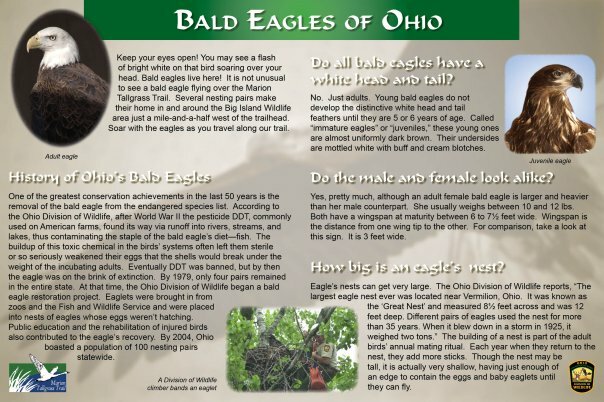 There have been as many as six bald eagles in the area around the trail Juveniles, young eagles, don't get their famous white crown feather until almost five. So be on the watch for the juveniles. Hint: to identify juvenile eagles, study the wing shape in flight. 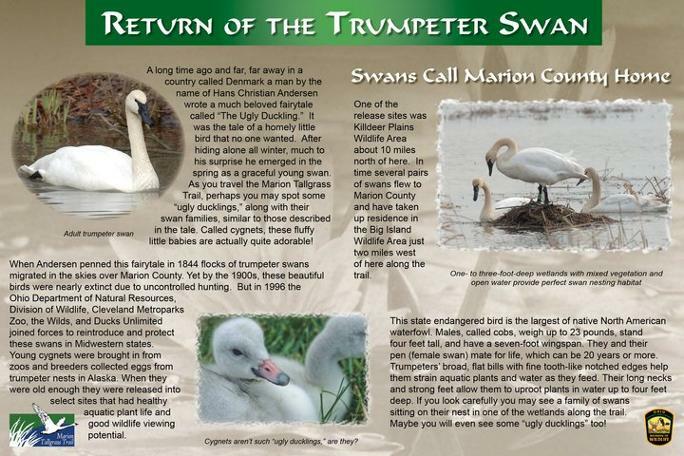 This sign tells the story of the wild trumpeter swan, which was almost eradicated from Ohio by hunting. Thanks to the efforts of the Ohio Dept of Natural Resources, Cleveland Metro Parks and Ducks Unlimited this specie was reintroduced in 1996. We now have a healthy population again. The 50 acre pond along Herr Rd and on the north side of the trail provides habitat for these swans. Quite often you can see a flock of swans cruising on the lake with their cygnet babies. The Marion Tallgrass Trail runs through the Sandusky Plains Tallgrass Prairie . This prairie once totaled over 190,000 acres and is now down to about 75 acres. The maps on the sign were done by a local prairie expert Mr. Kensel Clutter. 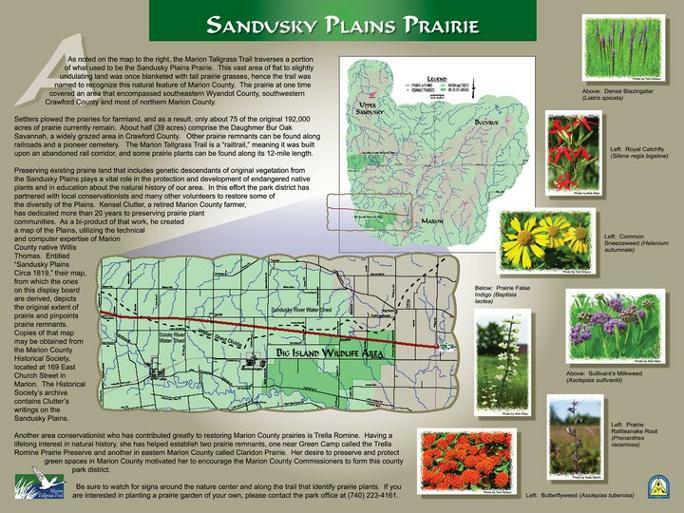 Our prairies have been sustained by his efforts, as well as the efforts of Trella Romine, OSU Marion Prairie Nature Center and Gale Martin, owner of Nature in Harmony (a prairie plant nursery).